San Marcos, CA, January 26, 2016 – Audience announced the introduction of its new top of the line Au24 SX interconnects, loudspeaker, phono and digital cables designed to achieve extraordinary audio performance and musical accuracy to complement the finest audio systems. Au24 SX substantially exceeds the performance of Audience’s long-standing and acclaimed Au24 cable lines by the use of improved XLPE (cross-linked polyethylene) dielectric material, higher-purity “six nines” copper, and by improvements to the cable geometry. The Au24 SX loudspeaker cables are of a heavier gauge than previous Au24 lines. In comparison to the previous versions, the new SX cables are more relaxed yet more dynamic sonically and have a richer tonal palette. The RCA connectors are a new proprietary solder free design. The XLR interconnect is an entirely new true dedicated differential cable designed from the ground up solely for use in balanced circuits. Audience Au24 SX cables, like all previous Au24 cables are low mass and low eddy current resistance designs using minimal jacketing materials. They retain music’s natural timing and timbre. The new Audience Au24 SX cables and interconnects are currently available. 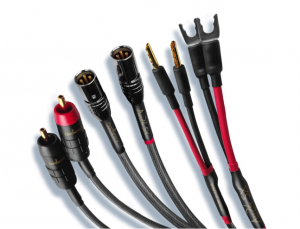 A one-meter pair of Au24 SX cables with RCA terminations has a suggested retail price of $1,800 per pair. Please consult Audience or an authorized Audience dealer for pricing of other lengths and configurations. Audience was formed in November 1997 by John McDonald and the late Richard Smith, as a design and production company focused on building the best possible audio and video equipment. To pass the Audience test, each product must truly make a significant contribution to the reproduction of audio and/or video. Audience offers loudspeakers, electronics, cables, power conditioners, high-resolution capacitors and the Auric Illuminator optical disk resolution enhancement. Audience’s commitment is to develop the very best products possible, and the company is committed to unexcelled customer service and product support. All Audience cables have an unconditional lifetime warranty and power conditioners have a ten-year warranty. For more information visit www.audience-av.com. Posted in Announcements, Au24 SX Cables, Cables, Press Releases.